It was difficult to separate the social and cultural benefits of this case study as they overlapped in so many respects, not least because the setting was a major European purveyor of culture. Both Beverley and Fran reported significant sociocultural benefits for them, for the children and for the school. The school has a history of Arts projects involving the local school community and innovative animation projects and as such it was primed for taking risks. Indeed Fran had herself been educated in an unorthodox manner where integrated, non-subject driven content was central. During my interview with her, she was impressed with being given so much freedom, so much in the way of resources and so much expert back-up: “At no point did they say ‘No!’”. For Bev also, the Year 4 teacher at the coal-face of delivery and logistics, it was a dream team fuelled by flow. When asked if she could have changed anything, Bev merely said that she would like recognition, almost absolution in fact, that she would perhaps not have time to cover the ICT topic for that term… which shows the pressure that most teachers are under to ‘sign off’ chunks of content in a timely fashion. The overall irony being that there had been an overwhelming accumulation of learning for all concerned in the areas of information, communication and technology. Media education is as much about the teacher’s ongoing willingness to learn and grow and Bev was a great example of this. A further consideration in terms of enhanced engagement in media-related educational practice is spatial arrangement and the physical environment in which children are immersed. Whilst the children were annotating the photos I videoed the group of girls in the audio transcript above and asked them how the photos (featuring locations rather than events) made them feel. Milly was unhesitant in her appraisal: “It felt like I’m at home”. There is an interesting mix of tenses here, as if the feeling, as prompted by the photo, was still fresh weeks later. See telferscot_culturalcampus_interview.mov @ 03:06 mins. As opposed to a one-off, this was a sustained project. Bev noted how much the children grew into the Southbank Centre: “Their confidence at using the Southbank is amazing, they believe it to be theirs”. A fact corroborated by Fran who received an email from parents whose child, on the strength of this project, had taken them to the Centre and given them “a guided tour”. 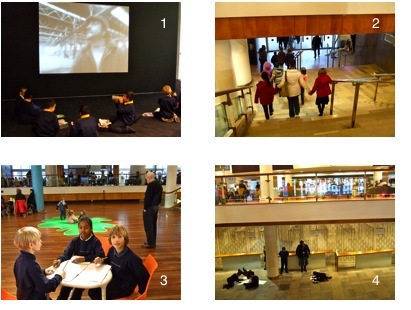 There was an overwhelming sense that the children had claimed this public space as their own: this was seen in the way they would settle into a particular ‘lunch space’ and interact with the area (photo1 below); the way they went from space to space and up and down stairs in an orderly, confident, chatty fashion (photo 2); also in the way they would settle down to work in groups (sometimes lying on the floor) in whatever space was allocated to them within the building (photos 3 & 4) without recourse to asking for permission, which had notably been the case at the start of the project. 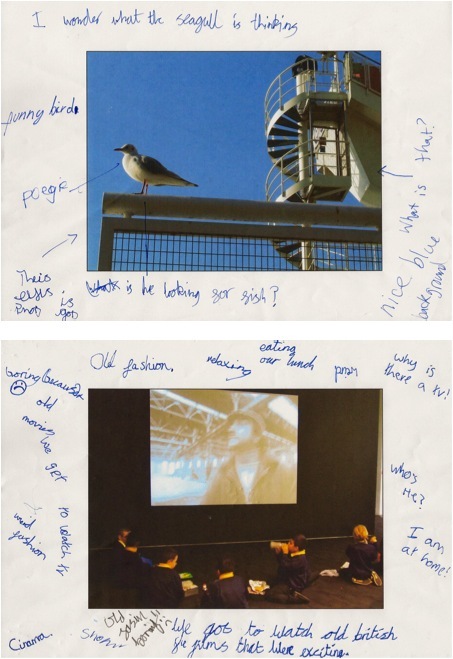 Photo 3 shows the children planning how their artwork and media creations could be publicly displayed: they are making co-design choices in the vicinity of toddlers, grandparents and chatting adults in a bar. This is mobile, relevant and engaged learning in a real-life context. Although most boroughs are not blessed with the resources of an international arts centre, this project is testament to the impact of committed institutional partnerships and restoring executive status to the teacher. It is the teacher leading the process, not the expert and this is the premise on which such a project could be more broadly replicated. Interviewer: Did you feel as though you were doing a lot of playing? Sarah: No, I felt as though I was doing lots of working. … one’s assumptions are challenged from the outset, thankfully. Sarah emphatically sets up a dialectic between working and playing and by repeating my sentence structure it is clear she has strong feelings about the project. From this and later comments, it strikes me that this is a girl who likes known parameters and for whom the fluidity of this project may not have worked so well. Milly: Yeah, so did I! Milly’s agreement stems from an intensity of engagement in particular aspects of the project rather than from any negative feeling. Jemima: It feels like work, but fun. Sarah maintains her position in the most rhetorical manner. Could it be that she is challenged by group work? dealing with change? making an extra effort or using her imagination? Int: Yeah, but did you enjoy it? Sarah’s disinterest is a refreshingly honest response and a testament to how young people’s responses are by no means homogenous. No matter how much adult time and effort invested, or opportunities or resources made available, Sarah reminds us that arts programmes of this nature are not necessarily the universal golden ticket and there will always be room for diversification and widening of appeal. Jemima is once again keen to make her voice heard and restore the positive. She was particularly enthusiastic most of the time. Indeed after a session recalling all the various creative and media-related activities that the children had undertaken over the previous weeks, she got up and exclaimed “Thank you world! This has been the best day ever!” See embedded video above telferscot_culturalcampus_interview.mov @ 04:48 mins. She also wrote “I love life!” on one of the photos a couple of weeks later. Sarah will not be swayed by Jemima’s optimism and perhaps the daily commute to the Southbank ‘to be put to work’ was just too much for her, preferring the predictable daily school routine closer to home. Int: Do you think anything’s erm.. changed since you started the…? The vagueness of the question is intended to generate as varied a response as possible, hopefully one that is personalised and heartfelt. Both Milly and Jemima respond with a characteristic willingness to learn. What has changed for them is the extent to which they have become more knowledgeable individuals and their critical awareness is primed to make the most of opportunities as they arise. They even suggest the next one should take place in Paris because they know so much about England now. Sarah: What do you mean what’s changed? With a natural sense of pragmatism, Sarah asks for clarification, she does not accept the vagueness of the question and needs specifics. Int: I mean is there anything different now to … the way you think about things? Sarah: Do you mean like if I have learnt anything? There’s a sense of reeling off a list here, of going through the motions. 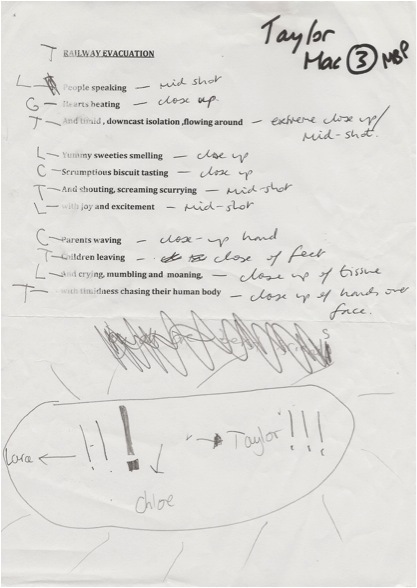 The CLC noted that some of the children were unclear about their ultimate aim i.e. to produce an art installation in Royal Festival Hall exhibition space, and that this objective needed to be explained on a number of occasions. Perhaps Sarah is a child who needs context in order to fully engage and perhaps more input as to why an art installation is considered a good thing in the first place. It is a further reminder that children need to be regarded as individuals where possible and although for most people collaborative, immersive arts projects might be fun in and of themselves, other more critically engaged children may need contextualisation and a rationale. Indeed, just as History has us questioning the reliability of sources, we could all benefit from a focus on context in the Arts, the better to start making connections between cultural institutions and the education sector. 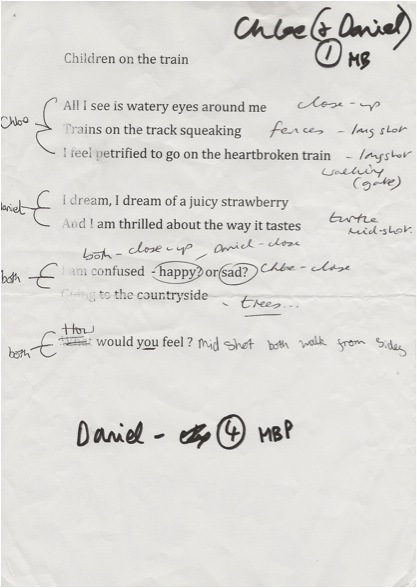 Int: … and what about the performing and all that, the poems, and the sketching, the photoshopping? 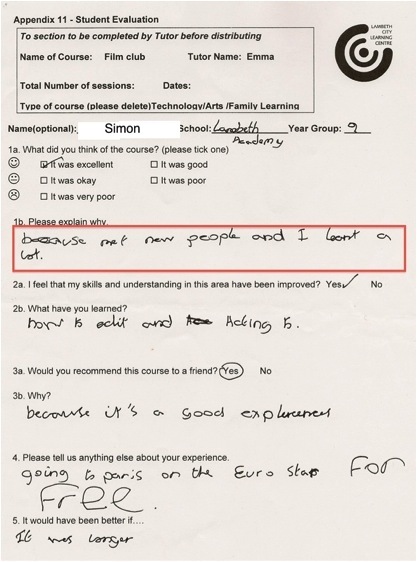 Recalling Simon at LA, here’s another unprompted, heartfelt and gratifying reference to future aspiration. 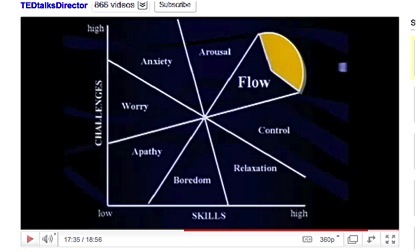 This comment exemplifies Milly’s having reached Vygotsky’s “zone of proximal development” (Vygotsky 1978:90). She has enjoyed being stretched beyond her comfort zone and has a thirst for more. Sarah: Really? You want to be a poet? This was the only time in the interview that Sarah responded with anything other than indifference. Her zone lies elsewhere. From her surprised tone, perhaps she’s more of a scientist and her needs might have been met with more of an end view in sight. The Cultural Campus is an initiative involving national institution partnerships and local schools, the purpose being to promote learning and socio-cultural understanding beyond the classroom and between institutions. The education departments of the BFI and Southbank Centre (SBC) teamed up with Lambeth City Learning Centre (LCLC) and a few local schools to deliver the school curriculum over a few specified weeks. The project is ongoing and my analysis centers on Telferscot Primary School (TPS), in Balham South London, from January 2011. 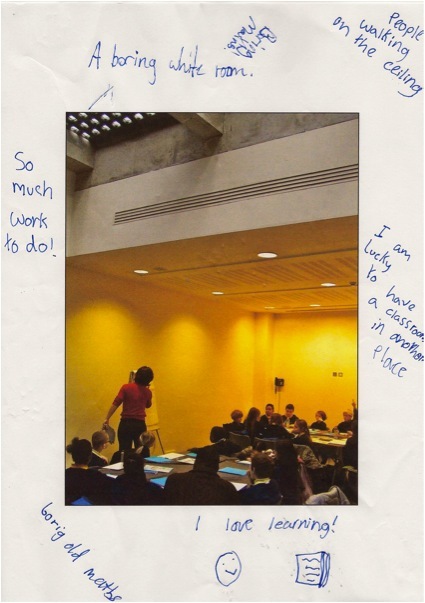 Beverley Keyte and her Year 4 class, under the guidance of Fran Welch the Assistant Head, spent two days a week in and around the Southbank complex for the first 6 weeks of the Spring term 2011. 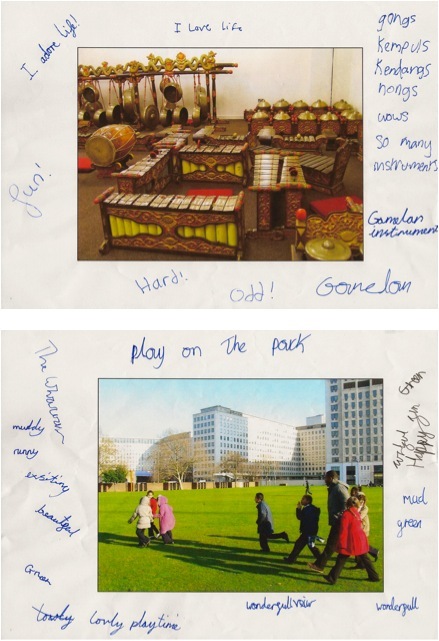 The idea was for the children to experience the entire Southbank environment as their ‘classroom’ for this period and display their creative output as part of the ‘Festival of Britain’ exhibition. Fran drew up an integrated programme of arts and media activities – highly original and multimodal in nature – under the theme ‘Feel the Beat of London Life’ which was to underpin its creative content as well as reflect the diverse footfall of visitors to the Southbank. In most cases, Fran’s thematic approach was a stimulating source of inspiration for the children and of ‘possibility thinking’ for the teachers. Activities included: writing narratives illustrated with surreal photoshopped collages of their own photos; performing their poetry in front a time-lapsed film using green screen technology; being filmed busking their poems outside the RFH; visiting the BFI Mediathèque and watching films; creating wordle compositions; producing podcasts and blog postings; sound collection & recording for later editing.